Anyone who has flown from transcontinental in the US, especially on United, South West or on the Denver-based Frontier Airlines has probably passed through Denver. 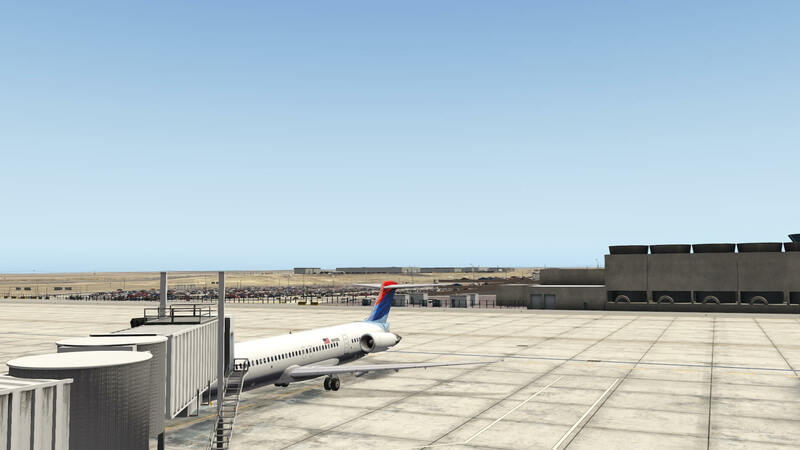 Known as the “Mile High” airport, and as discussed further below, Denver (DEN/KDEN) is a major hub feeding California, the US West Coast and the Mountain West. Wikipedia tells us that Denver is a city with a metro area population of $2.9 million, based at the extreme western edge of the Great Plains and abutting the Mountain West- a mountainous region that extends for approximately 1,000 miles to the West Coast. The “Mile High” reference comes from the fact that the official airport elevation is 5,434 feet (1.656 m) above sea level, resulting from the huge tectonic forces when the Rocky Mountains were thrust upwards over 60 million years ago. The air is thinner at this altitude than at sea level (where aircraft performance is measured), and in the summer with temperatures above 90 degrees F (32 C) for most of the day (also creating even a thinner atmosphere), aircraft performance can be impaired and require additional care in loading aircraft to provide for safe takeoffs. More on this in the appendix at the end of the article. 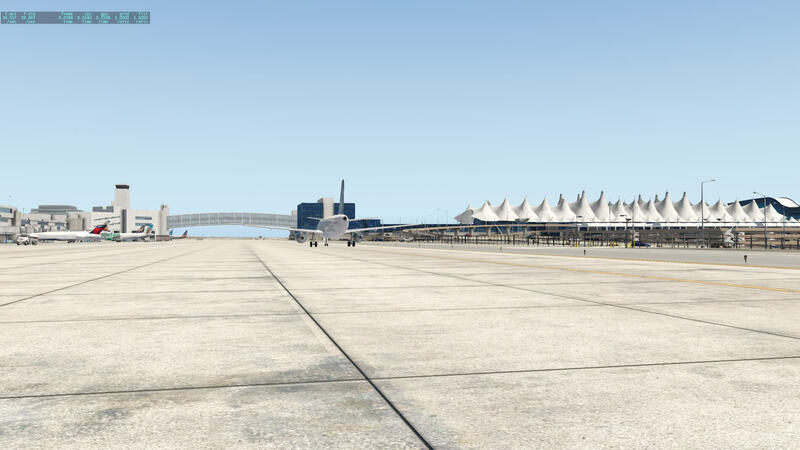 KDEN is notable for several reasons. Opened in 1995, it was and still is the newest major airport in the US that was designed from the “ground up”. At 33,531 acres (13,570 ha), it is the largest airport by area in the US and the second largest in the world after King Fahd International in Saudi Arabia. It is also the second largest public works project in the world after the Chunnel linking England and France. It was the 20th largest by air traffic in the world in 2017. When it opened it was $US 2 billion over budget at a cost of $US 5.2 billion, and opened a year-and-a half later than originally planned. With over 35,000 employees it is the largest employer in the state of Colorado. The project cost $5.2 billion, which was $2 billion over budget and opened a year and a half behind schedule. Construction of this huge facility with 138 gates and a 327 foot tall control tower required 11,000 workers at its height. 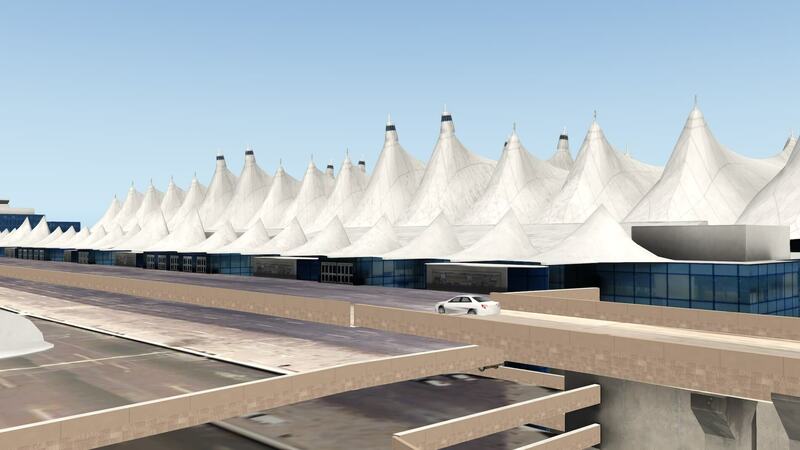 The main innovation DIA (Denver International Airport) brought to Denver, unlike then existing Stapleton Airport, was a design to handle Denver’s unusual wind and weather patterns. The airport was laid out in a pinwheel configuration and is located well outside the city in anticipation of future expansion in the 21st century. 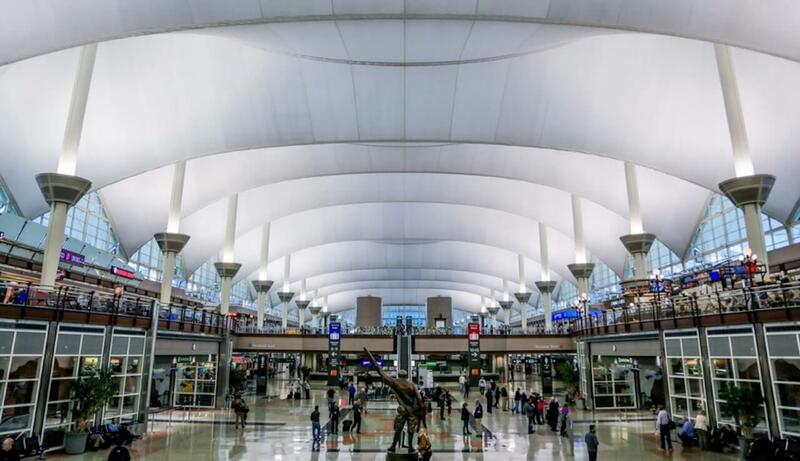 So, we ask- why is the airport designed in this way, and how was air traffic handled in Denver prior to its opening in 1995? To understand these questions we need to look at its predecessor, Denver Stapleton. Opened in 1929, on October 17 (one week to the day prior to the world stock market crashes and the Great Depression), it was renamed Stapleton airport after Denver mayor Benjamin Stapleton in 1944. Serving to bridge the aircraft range gap for US transcontinental flights at the time, it was located in the eastern suburbs of Denver. Denver has for many years had a significant net in-migration (due largely to the climate – over 300 blue-sky days a year- and the proximity to the ski slopes in the Rockies as well as excellent hiking and recreation all year round) which meant growth in the region- which still continues today, with the Denver region now the “Silicon Valley” of aerospace . The coming of the jet age meant new runways and extensions to existing infrastructure. Meanwhile, since Denver cannot expand easily to the west due to the Rocky Mountains and foothills, the city grew to surround the airport, restricting development and runway extensions to handle the ever-growing air traffic. Landings were normally done on a set of close parallel runways (26 L/R), as well as a close runway 25, however the close proximity to these runways prevented simultaneous approaches (see a technical article in the appendix at the end of the review showing the FAA rules regarding parallel approaches related to runway spacing). Another issue was the steep descent required of aircraft arriving from the west, to clear the Rocky Mountains, then do a long procedure turn over the DEN VOR to land back towards the west. Departures were normally carried out on 35 L/R, which were offset to allow for more flexibility, however the noise was increasingly becoming an issue for the growing residential areas to the north-east of the city. Parking was a nightmare, even curbside drop-offs were tough with large lines of cars due to the inadequate road infrastructure. Taxiways were not designed to keep up with the increased air traffic, causing gridlock at times and even requiring tugs to deploy to push back an aircraft on a taxiway, to break the logjam. These air traffic delays propagated through the US aviation system almost daily, causing delays across the nation- such was the strategic importance of Denver airport to the entire country. So it was that in the early 1980’s that the Denver area began work on finding a site for a brand new airport. 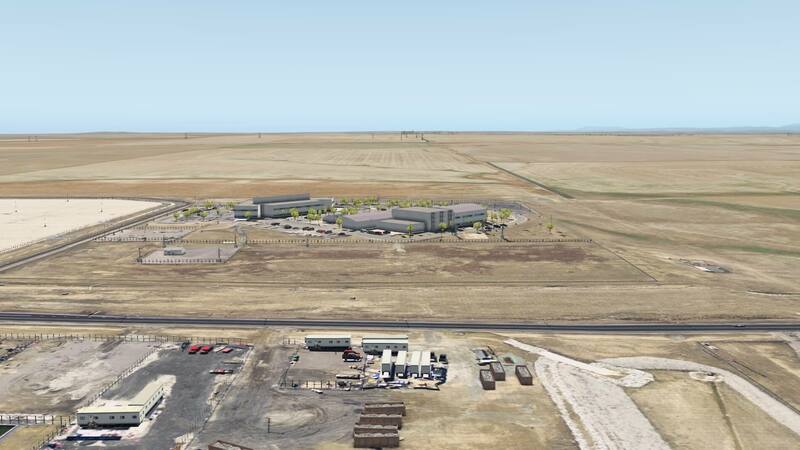 Land was annexed from a neighboring county to supplement the land already part of the City and County of Denver and voters approved tax increases and debt issuance to build the project. I have referred to some of the metrics above regarding the magnitude of the project. Interestingly, the new airport was to have the same code (DEN/KDEN) as Stapleton did, and the airport VOR (DEN) was also transferred to the new facility. 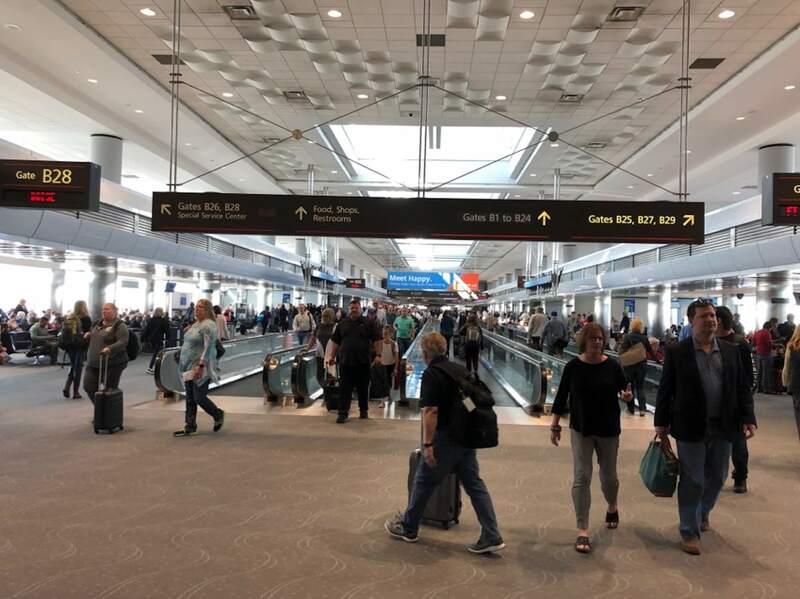 The locals, who didn’t want to confuse the two airports with the same name and code, called the new facility “DIA” (Denver International Airport) and “DIA” is used here right through today. All of the airlines’ assets needed to be transferred to the new facility during the transition, which took place on the evening of February 27, 1995. The last flight out of Stapleton was Continental 34, a DC10 to London Gatwick, after which the airport was closed. Some links – link I and link II. DIA finally replaced Stapleton on February 28, 1995. Today, some 24 years later, the old Stapleton airport has been demolished and is now a thriving residential and business community on Denver’s east side. The only remaining artifact from the old airport is the control tower. While Stapleton was only 3 miles (4.8km) from downtown Denver (that proximity to the city center became its biggest problem as the city surrounded it), the new DIA is 25 miles (40 km). That’s in excess of a $40 taxicab ride. 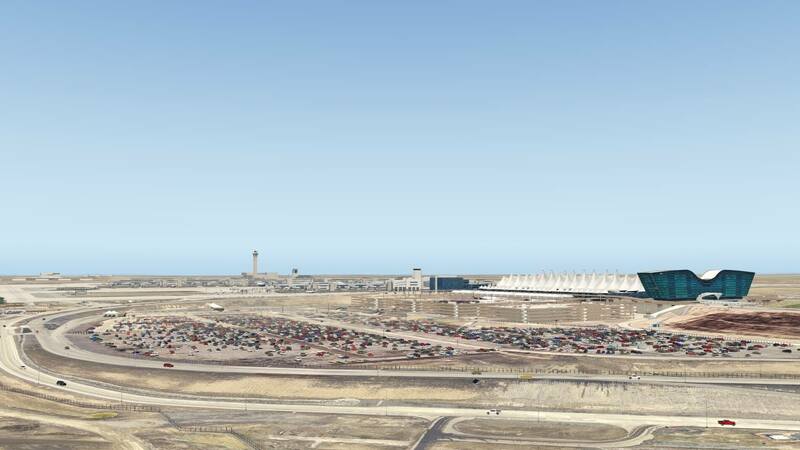 The inconvenience is due to the airport being built on land, where enough existed that was able to be developed, and is beyond any outgrowth projections for the City of Denver. 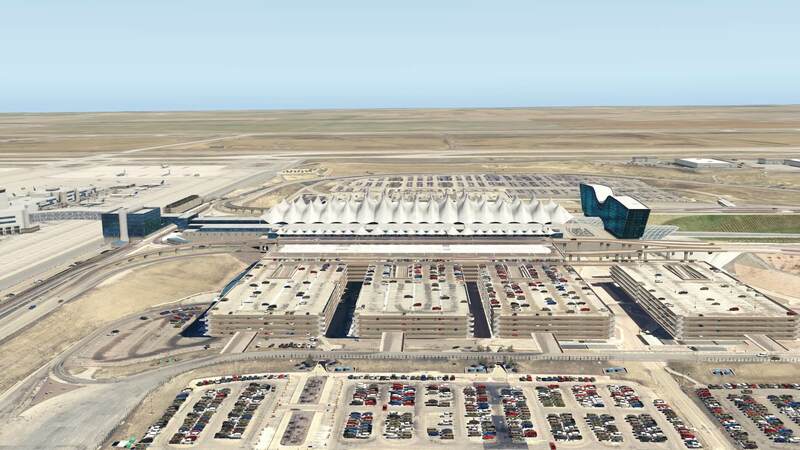 But beyond that issue, KDEN is a masterpiece of engineering, designed to offer ease of air traffic congestion that originates, terminates or passes through this huge hub. It’s also designed to be passenger friendly, minimizing walking distances even though the terminal and concourse structure which is well spaced out to allow aircraft to pushed back from opposing directions simultaneously between concourses while still allowing for bidirectional taxying within the same area. To justify the expenditures on the airport, under a regional agreement other airports in the area are prohibited from operating Part 121 operations (common carriage). However, at least 5 airports are within 50 miles, 3 of them are towered and all are capable of taking jet aircraft. They are termed “reliever airports” to try and divert General Aviation and for-hire operations away from KDEN. 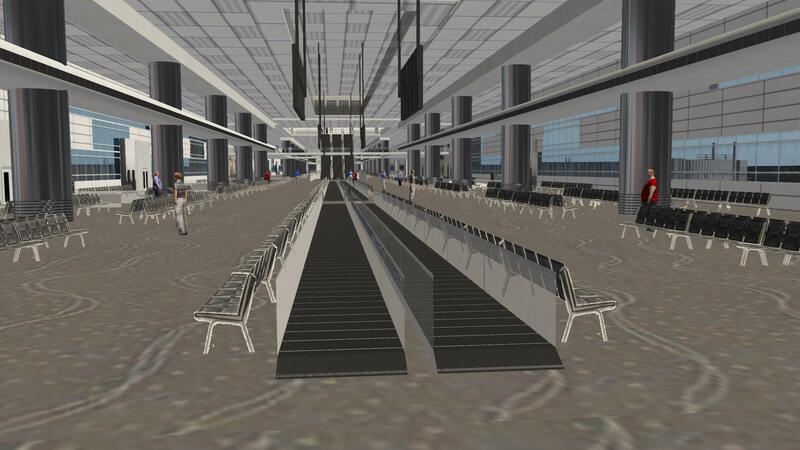 From a passenger perspective, the terminal is spilt into East and West, and is aligned north-south. Each terminal contains 5 levels of parking, access to an electrified commuter train network that terminates at Denver’s Union Station, an automated electric train system that connects underground between the Terminal and the three Concourses, a spacious and modern customs area, and three Concourses that have a total of 137 gates (a new construction program just now starting will add a further 39 gates, a 28% increase in air traffic capacity). Each Concourse has many shops, restaurants and bars, and ample seating area for waiting passengers. As mentioned above, the 3 concourses are connected by an automated underground train system, other than Concourse A that also has a footbridge (termed an “airbridge”) to the Terminal building. But is in the air traffic portion of KDEN’s operations where the efficiencies and effectiveness really shine. Most passengers are unaware of this of course, and take high density on-time departures and arrivals as an expectation. For departures there are 20 Departure Procedures, each tailored specifically for the runway in use (most apply to multiple runways), the intended direction of the departure and which en-route airway the flight will be cruising at. Likewise, for arrivals, there are 24 STARs and a massive 44 instrument approaches, each tailored specifically to the direction of arrival, the airway used to transition to the STAR and the intended landing runway. As in the departures they compromise land-based (navaids VOR, ILS / LOC) as well as RNAV. Using the flexibility of the huge combination of instrument procedures, as well as the runway layout (discussed next), it is possible to have simultaneous arrivals and departures along many parallel tracks and this adds to the extensive efficiency of the air traffic operations. All of these procedures requires an effective Terminal Radar Approach CONtrol (TRACON). 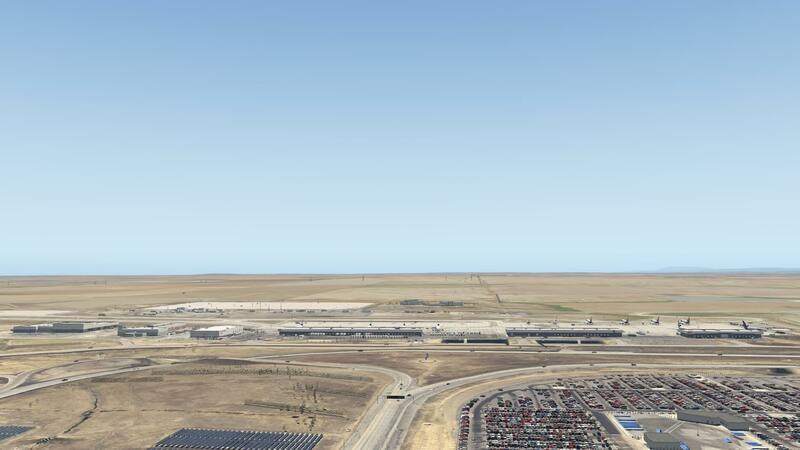 A new TRACON (Denver Approach) was built from the ground up when the airport was constructed, and is on airport land adjacent to the terminal. In a first (I believe) for the US, TRACON operations extend from 7,000 feet (2,000 feet above the airport) up to FL 230. This changes from day to day per operational considerations. But the best part for air traffic operations is the runway layout. To do it like this takes a lot of land, and that’s evident from KDEN being the second biggest in land area in the world. 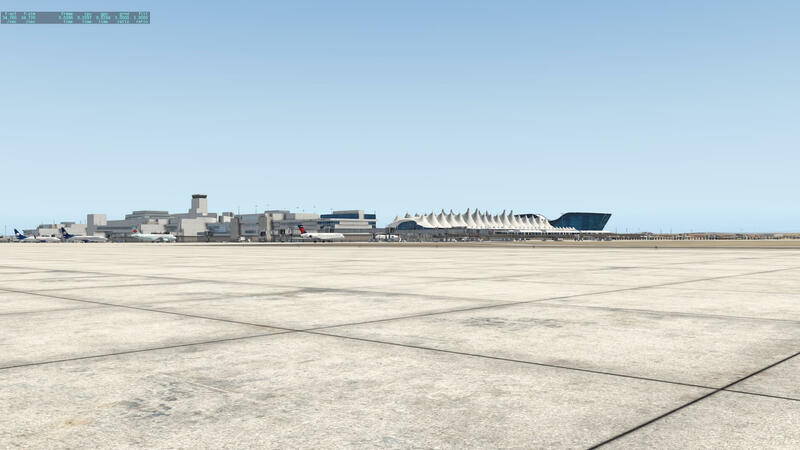 The land area of KDEN is bigger than KORD and KDFW combined (and they are both behemoths). It allows for no crossing runways, only 2 runways in close proximity to each other, and with a few exceptions each runway is operated completely independently from one-another (there are very few operational interdependencies between runways). 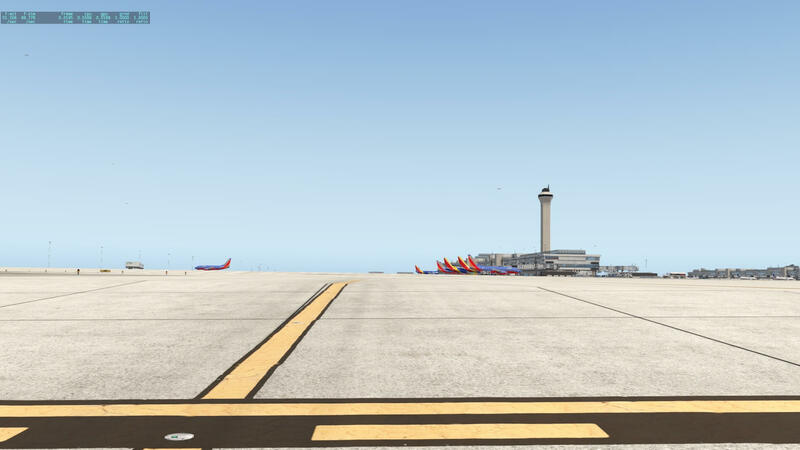 It’s called “Diverging Departures” and “Converging Arrivals”, and I’ve used a screenshot (below) of the X-Plane 11 runway layout to demonstrate. The blue arrows represent departures and the red arrows signify arrivals. Note that departure runways start near the terminal, and arrival runways end at the terminal (diverging and converging). The three green arrows at the bottom of the screenshot represent the widely spaced parallel runway combinations of 17L/35R, 17R/35L and 16L/34R, allowing for three independent and concurrent approaches in IMC. Airport diagram may be out of date, do not use for navigationThere are 6 reciprocal runways. Runway 34R/16L is the newest and longest at 16,000 feet, the longest of any non-military airport in the US. on the north-west side of the airport. Adjacent is 34R/16R, making the only parallel pair of runways that are closely spaced. The southern end of these runways is adjacent to the concourse complex and is normally used for northerly departures and southerly arrivals. Runways 35L/17R and 35R/17R are on the southeast side of the airport. This parallel pair of runways are not closely spaced and allow for independent and simultaneous parallel approaches. The northern end of these runways are closer to the concourse complex, so are usually used for southerly departures or northerly arrivals. 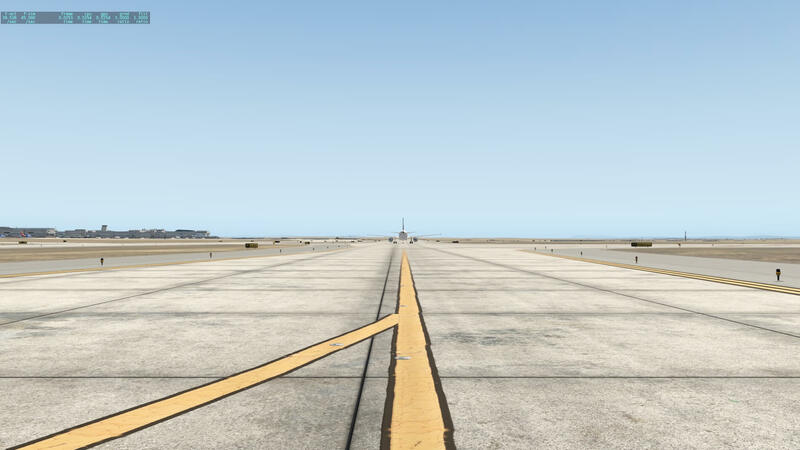 When coupled with one of 16L/34R or 16R/34L (above), this provides 3 sets of parallel runways that can be used independently and simultaneously- providing more flexibility than most other world airports. 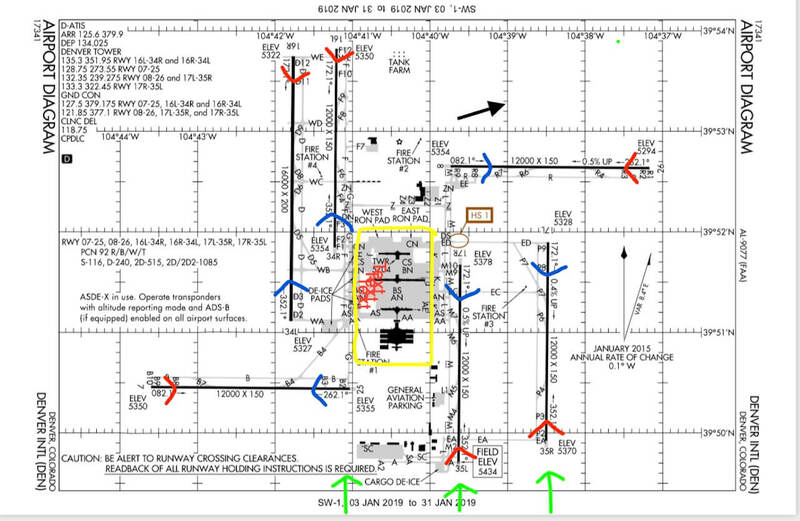 Most IMC weather in this area is coincident with northerly winds, and this triad of independent runways provides for Cat III/C approaches operating as independently as is possible for parallel approaches. Perpendicular to these north-south runways is 07/25 and 08/26. The former is on the south west side of the airport, and with the eastern end closer to the concourse complex, so is primarily used for westerly departures and easterly arrivals. The latter is on the north-east side of the airport, and with the westerly end being closer to the concourse complex is used primarily for easterly departures and westerly arrivals. This runway configuration, together with the very rich compliment of DP’s and STAR’s, allows for simultaneous “pushes” and arrivals of hub banks for different airlines. Since most of the runway environment is located far enough away from the concourse structure so that it all can’t be seen from one vantage point, it makes even complex and busy air operations appear to be not busy from a passenger’s perspective. Most passengers have no idea of the complexity of air operations that exist at KDEN. Links to articles on Stapleton and DIA (both KDEN) that I have sourced in this article are of courtesy from Wikipedia, Industrytap, World Population Review and Redshed. 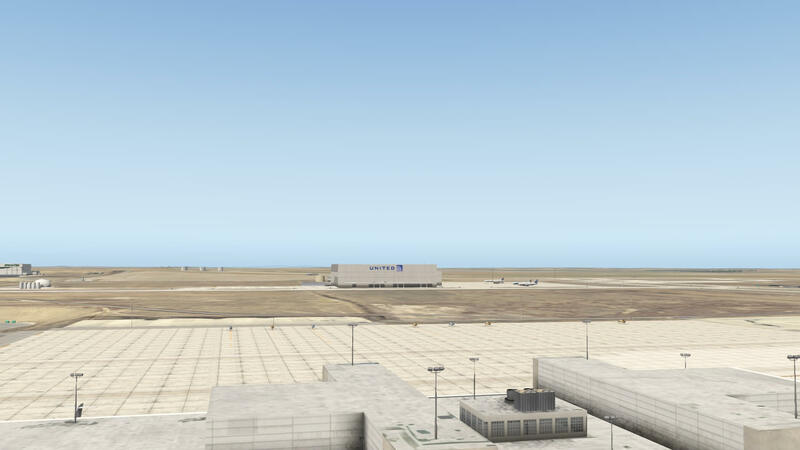 Having the above knowledge, it’s a great privilege to be able to review the new KDEN scenery by X-Codr. 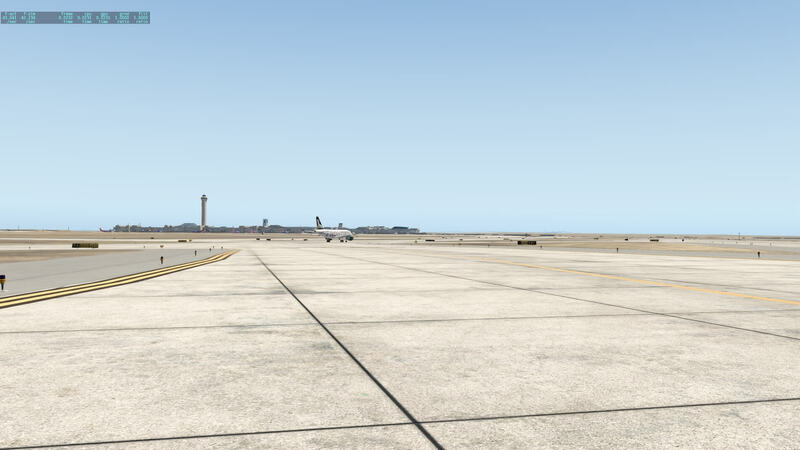 Firstly, comparing the X-Plane 11.26r2 / X-Plane 11.30r3 default KDEN scenery with this add-on. There are three comparative sets of screenshots below that illustrate the difference between the default scenery (on the left), and that made by X-Codr on the right). The first set show approaching the terminal from the south, facing north. You can see the symmetry of the complex, with both under-cover and open car parks to the east and west of the terminal. The Concourses to the north face east and west, and are centered on the Terminal. In the addon scenery you can see that the twin rail tracks terminate nicely into a station platform, even having an electrified catenary, and the trains that run are actually commuter train sets, rather than big freight trains in the default scenery. 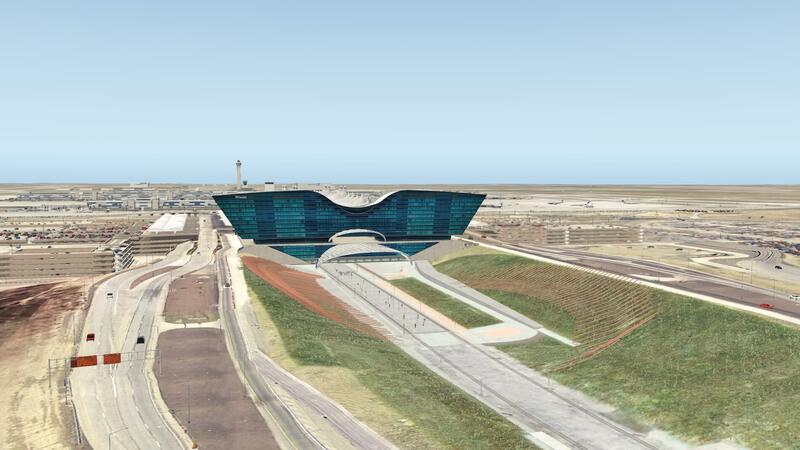 The biggest difference is in the rendering of the Terminal building, including the Westin hotel on the southern end that was added to the structure in 2015. Some background info of the hotel; “The hotel sits above the airport’s new transit center, set to open next April. Together, these projects make up the Denver Hotel and Transit Center. The commanding glass-and-steel structure comprises more than 433,000 sq ft. The hotel offers 519 guest rooms, 35 suites and a 37,500-sq-ft conference center. 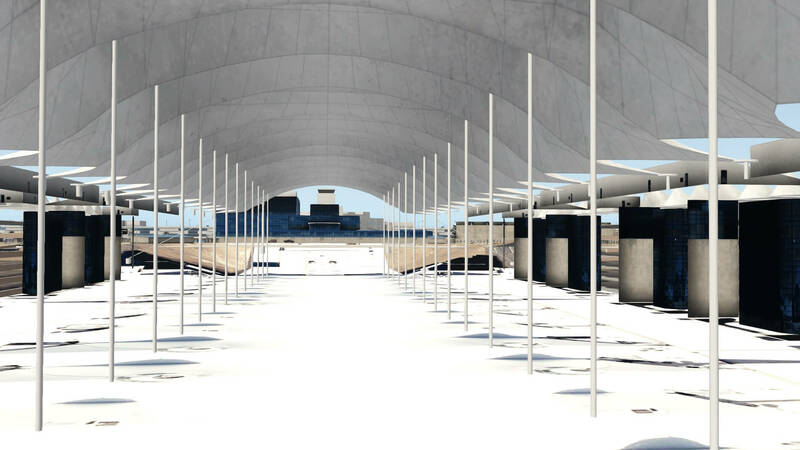 X-Codr has done a great job with the Terminal roof, a Teflon structure that was designed to look like the snow-capped (in winter) Rocky Mountains. The roadways are well made (rather than simply stopping), and the mesh provided shows very accurately the excavated contours of the land that makes this layout possible. One item that is noticeable is the ground texture color, in the “non-winter” season. It actually looks more accurate in the default scenery (at least for spring and early summer). I asked X-Codr why that was so; “….The spring season is not included in the scenery. The reason for this is space. For this to make sense, you have to understand that winter textures are done via a decal. This is sort of like a photoshop filter that modifies the ortho-photo textures in sim. The following set show the area between Concourses A and B. This area is enormous, allowing aircraft to be pushed back without being turned from both Concourses towards each other, as well as allowing for two-way traffic taxying in the middle. The addition of textures and detail by X-Codr can be easily seen here. It looks just like the real thing. In the last comparison below, taken at dusk, the lighting and detail is incomparable between the default and the add-on sceneries. It’s simply amazing! The one critique I would offer to X-Codr is the lack of light showing through the Teflon roof of the Terminal. 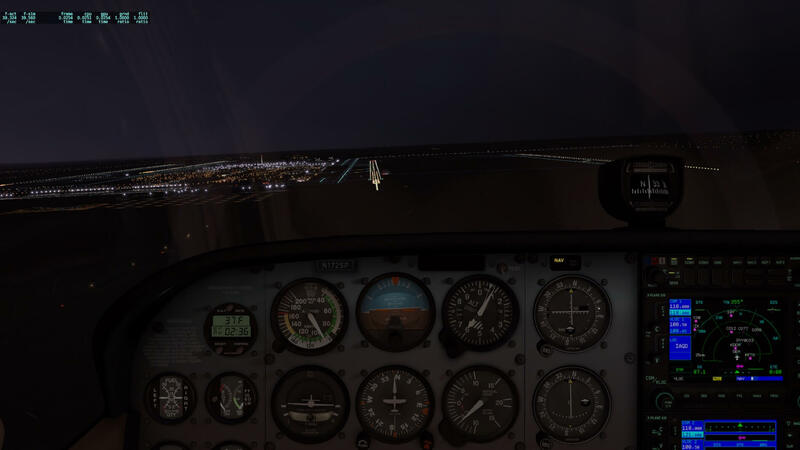 This lighting can be seen from aircraft at 50 miles out at night, offering yet another enhancement to VFR flight for flight crews. This may be a limitation of X-Plane 11. So, enough of the comparisons. 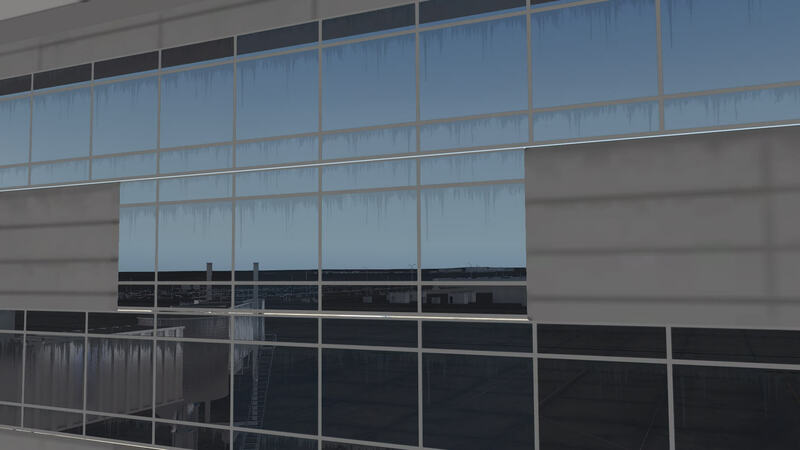 Referring to the screenshots below this text, firstly a look from the south-west side of the terminal building, showing the detail in the roof, parking structures and (with the mesh) the topography- all accurately portrayed. Again from the western side of the terminal, showing the Westin hotel on the right (south) and the customs / administration building, plus the connecting walkway to Concourse A to the far left (north). Then a closer look at the commuter rail network station- very well done, even has people waiting for the next train (the “A line to Denver Union station). Next the Terminal West drop-off area, taken from the upper level of the covered car parking building. This is on the 6th floor of the Terminal and car parking complex. 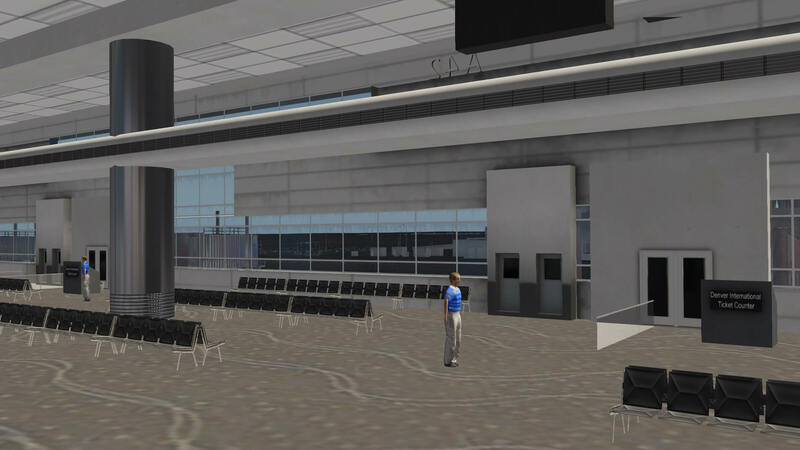 I then took a walk inside the Terminal building- it’s rather sparse when you compare this with the photo of the inside of the Terminal earlier in this review, but I understand that X-Codr is trying to keep the number of objects down and the fps up! 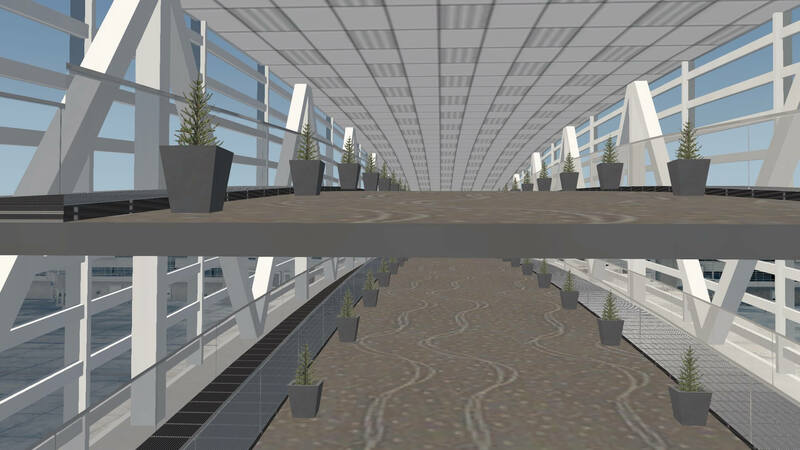 Moving further north of the Terminal and the administration / customs building, is a very well made rendition of the walkway to Concourse A. Even the plants to the sides are correct! 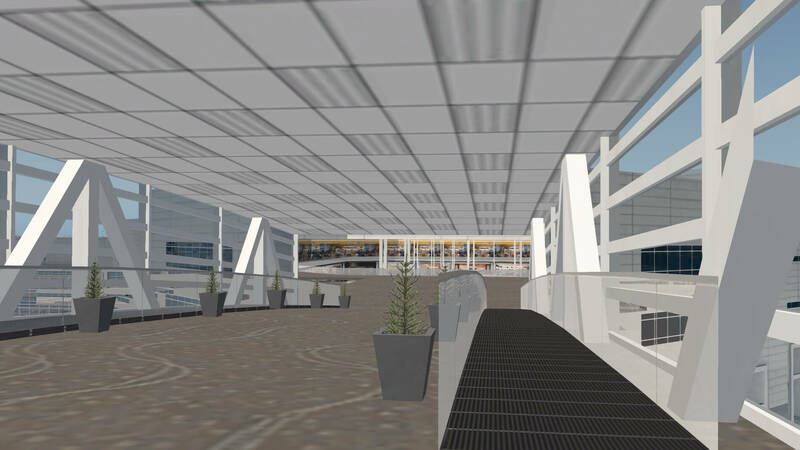 I have shown a view along the upper floor, where there are two levels to allow for normal domestic and sterile pre-immigration international arrivals. Another view of the same showing the “people mover” belt to the right and left of the walking area. I usually take the airbridge as the security/TSA line is smaller, and the slope leading down into Concourse A is so real! The walkway/airbridge is raised in the middle to allow for aircraft to taxi under it, and has this same slope at both ends. You can also take the underground train to Concourse A, but it’s not a scenic as this way!! 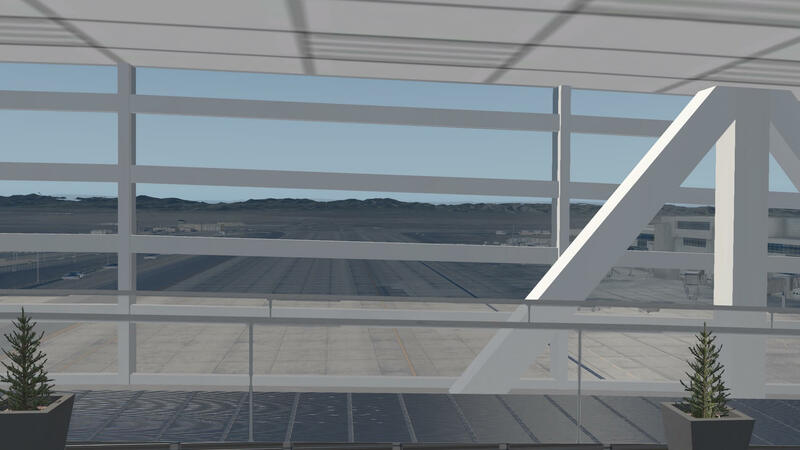 Also shown is a view to the west from the airbridge. Note that no aircraft are visible, something I will comment on in a moment. Concourse A, the closest to the Terminal building, was originally constructed for Frontier Airlines, the local Denver carrier, as well as all international arrivals and foreign airline departures, since this is the only concourse that has a sterile access to customs and immigration. 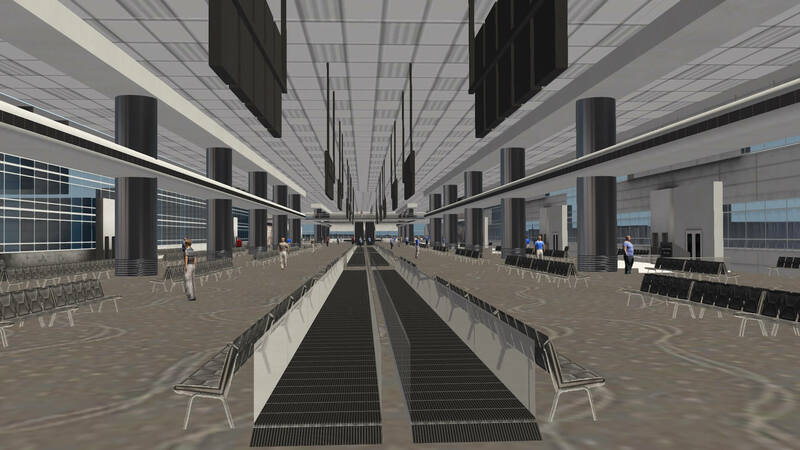 However, some of the Frontier gates have since been leased to both Delta and American Airlines, who were formerly at Concourse C.
Referring to the screenshots below, once over the airbridge, this is very close to what you see in the center of Concourse A. You can look down to underground train (the oblong tunnel shape at the bottom), and the various shops and restaurants that in this central area. You are well and truly “air-side” at this point, through airport security. 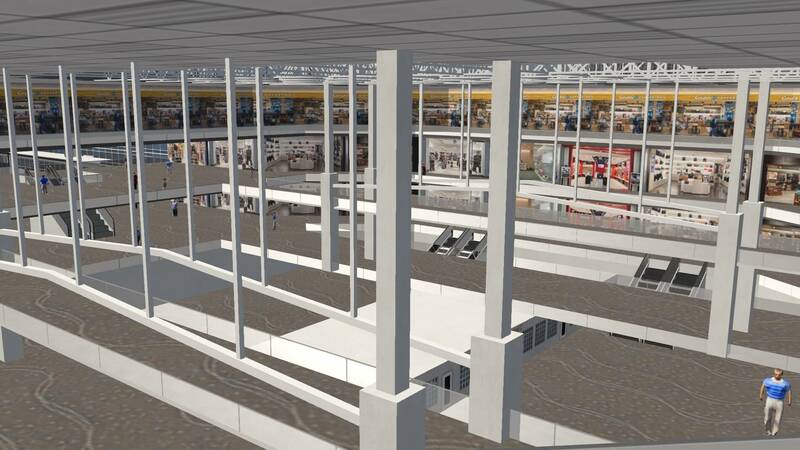 Next, I show the internal look at Concourse A, looking east. The sets of chairs look just like the real thing! The dimensions look very accurate also. A lot of work has gone into making this as close as it is to reality. The shot that looks at the doors through which you board the aircraft are well done, although the text “Denver International Ticket Counter” is generic. I next attempt to look outside the glass to see the aircraft parked at the gate. The tarmac is visible, plus the structure adjacent to our location. I can also see the airbridge to board through. If I move just a short distance to “pass through” the window I now can see the parked aircraft. Finally, a shot looking north to Concourse B, our next destination. You can see from this vantage point the large area between Concourses A and B (is the same between B and C), that allows for aircraft to pushed back towards each other and still leave room for bidirectional taxying aircraft. Now you can see why this airport occupies so much land area! Concourse B was designed for United Airlines, the largest that has a base at KDEN. It’s the largest of all the concourses, and is a strategic hub for United for its West Coast operations. There are daily multiple east and west coast banks through this important hub, which is ideally located for the entire West Coast area- including, of course, the most populous state in the nation- California. 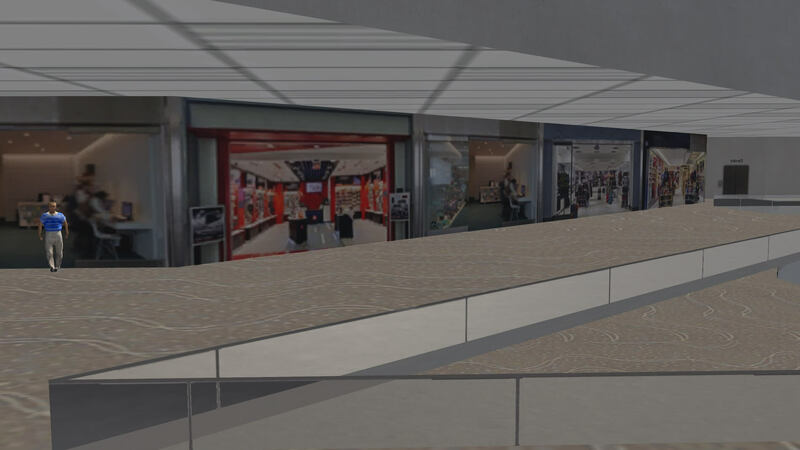 My first screen shot (below) shows the shopping/restaurant area at the center of this Concourse- which us similar to the other Concourses in that it’s in an area that has access to the underground train, as well as housing United’s local flight operations area. 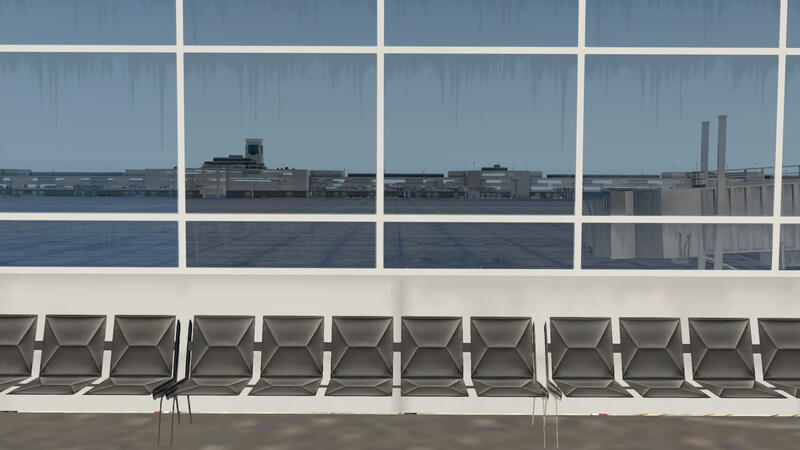 In the next screenshot I show a comparison of Concourse B, looking to the east, both from the add-on scenery and a photo I took late in 2018. While no-one could expect the fidelity of an add-on to be as good as a real photo, I am impressed by the amount of work and attention to detail that X-Codr has put into this product. Looking north to Concourse C- once again I have traversed the Concourse B wall so that I can show a more clear picture and include aircraft docked at the gates. Finally, a look from outside the Concourse infrastructure at the extension to Concourse B that is used for United’s regional operations (United Express). You can see that these regional gates are lower than the main concourse, with no underfloor access to ground operations. I have used this United Express terminal several times and it’s almost like going into a small “dolls house” after being in the larger portion of Concourse B.
I did not “visit” Concourse C, however it is built in the add-on with similar attention to detail. This concourse is primarily used by South-West Airlines, as well as overflow for United, American and Delta airlines, and smaller airlines that do not have an operations center or hub at KDEN. I do show (below) the United maintenance hanger (on the north-east side), a look from the control tower (no internal rendering) which is placed above Concourse C (most northern concourse), looking back south at Concourses A and B, and at the Terminal, Again from the tower in the general direction of the city of Denver to the south-west; a look slewed above the Terminal, looking south, to the Cargo and General Aviation (GA) facilities. 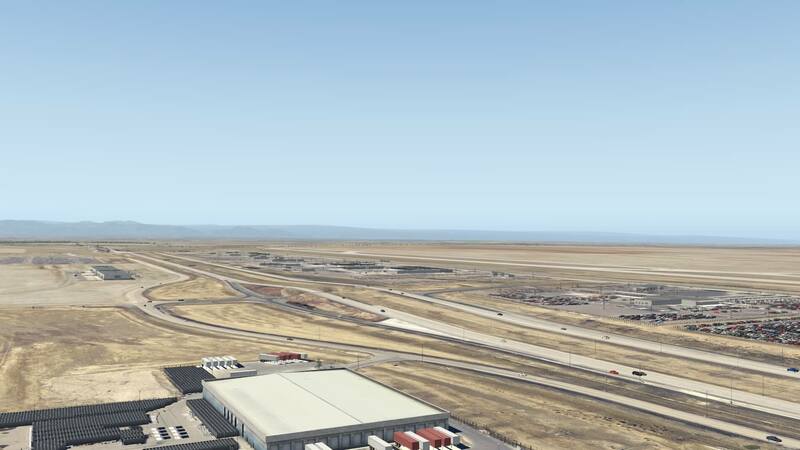 Further south still to the extreme south-west corner of the airport where the TRACON buildings are located; and a screenshot taken above the Cargo complex showing Pena Boulevard – the main entry/exit freeway to/from the airport, with the rental car facilities on the north side of the freeway. Included in the KDEN add-on package is a folder “ClassicJetSimUtils”, that contains subfolders that work with World Traffic 3 (WT3). 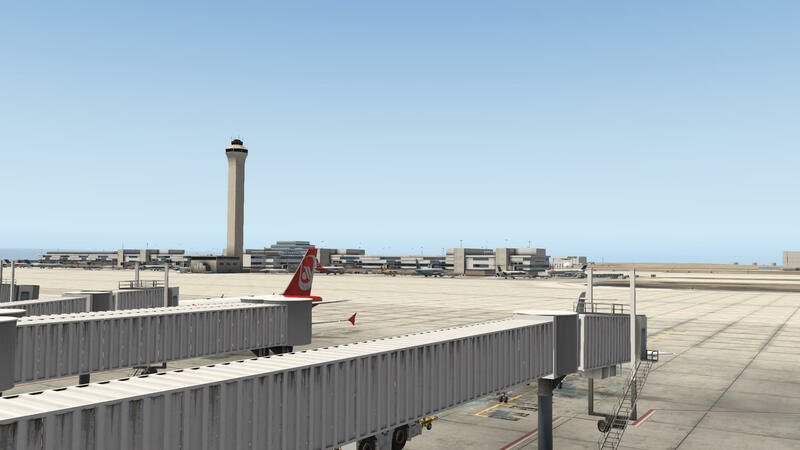 I decided to install WT3, and after downloading the route and aircraft patches I then merged the above folder set to see what taxi and flight routes are being utilized at KDEN. I loaded my C172 (no panel) into KDEN then re-synced WT3 to spawn traffic- both at the concourse gates and arriving / departing. My first endeavor was to taxi through all of the gate areas around the three concourses. 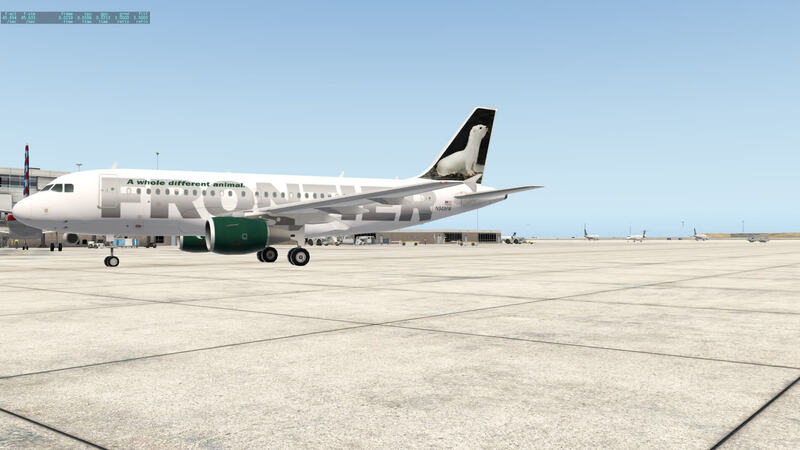 Referring to the screenshots below: I first taxied in an easterly direction on the northern edge of Concourse 3- as expected it’s populated with South-west Airlines B737’s. After moving around Concourse 3 I then taxied between Concourse 2 and 3- once again as expected United Airlines to the left at Concourse 2 and more South-west Airlines to the right at Concourse 3. 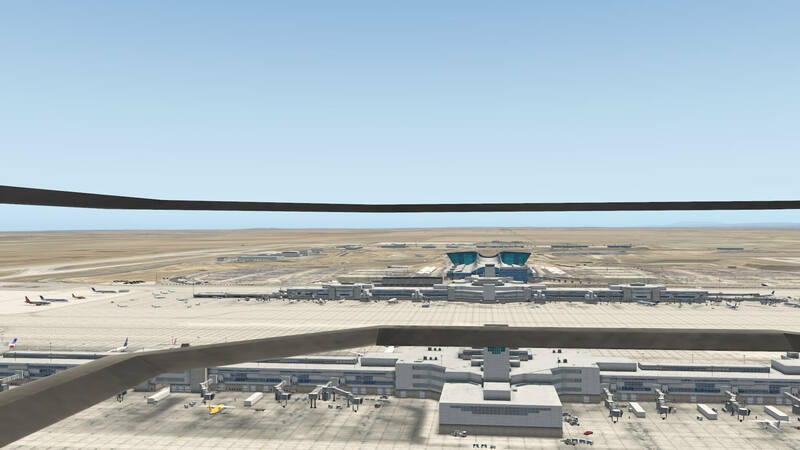 The control tower is very visible as being a part of Concourse 3 in this second screenshot below. Next turning into the taxiway in between Concourse 1 and 2, showing the Terminal complex further to the south. An Air Canada aircraft can be seen at the international arrival gate to the right, a part of Concourse A which is the only concourse that has a sterile access to customs and immigration. 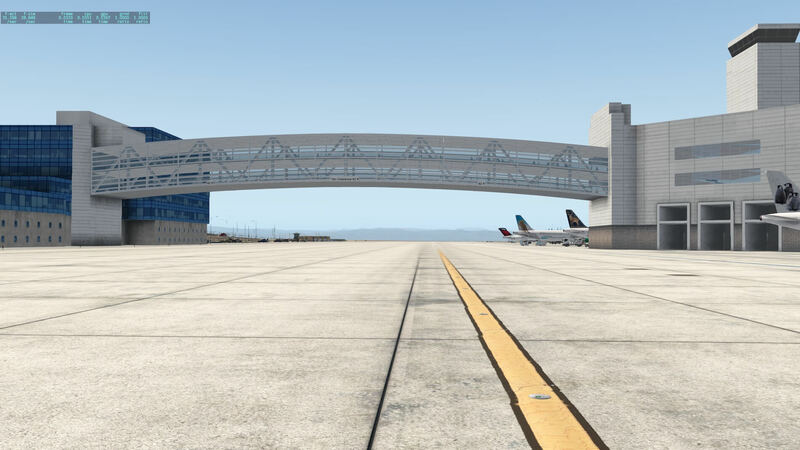 Now having moved into the taxiway between Concourse A and the Terminal complex, showing some American Airlines aircraft to the right, and the air-bridge ahead between Concourse A and Terminal A as well as a sterile access to customs (there are two levels in the air-bridge. Then a closer look at the air-bridge, and Frontier Airlines aircraft beyond to the right, docked at Concourse A gates. 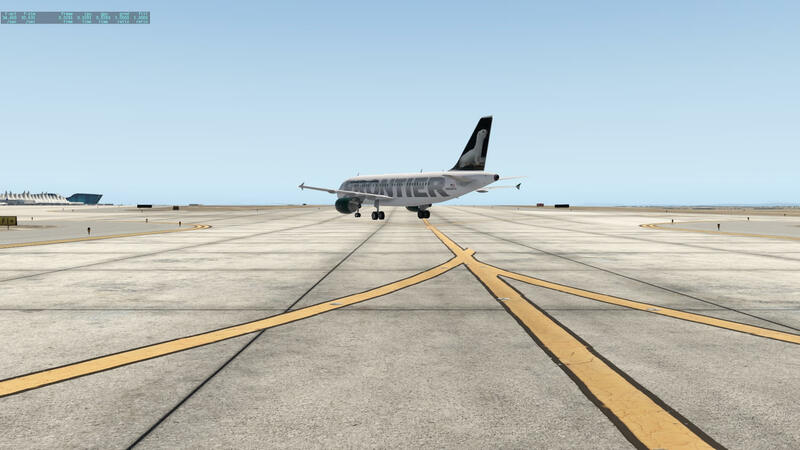 Finally, in this air operations portion, I took off from runway 34R. You will see the landing lights of the three aircraft ahead of me lined up to land on the reciprocal 16L- this runway is usually used for landing as the end is close to the Concourse area (converging arrival). 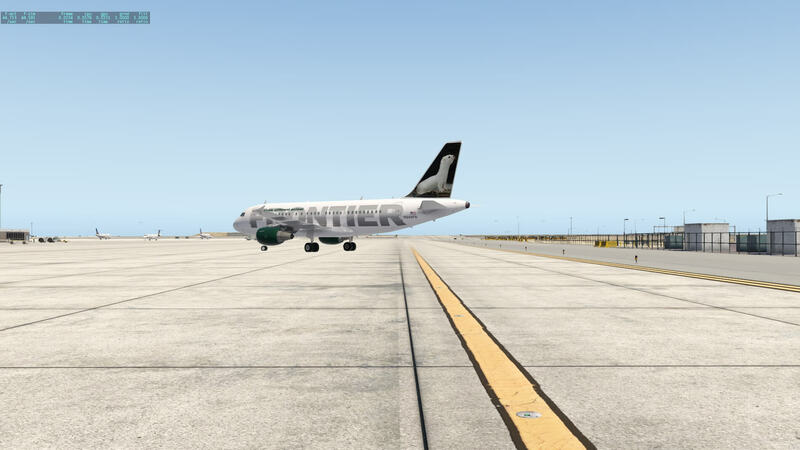 I then chose to follow a Frontier Airlines aircraft (one of the three arrivals above) to its gate. I even show the aircraft taxying under the air-bridge, and other than a little quirk in how the aircraft did a “180” turn then went back to gate A42, the taxi route seemed to be very realistic. I don’t fly as a pilot in or out of KDEN (other than once when I was training for my IFR rating), but based on my observations as a passenger, it looks very good. I am not commenting on WT3 as its not what I’m reviewing, and I know little about it, but the WT3 files included in the KDEN package do add credible realism. 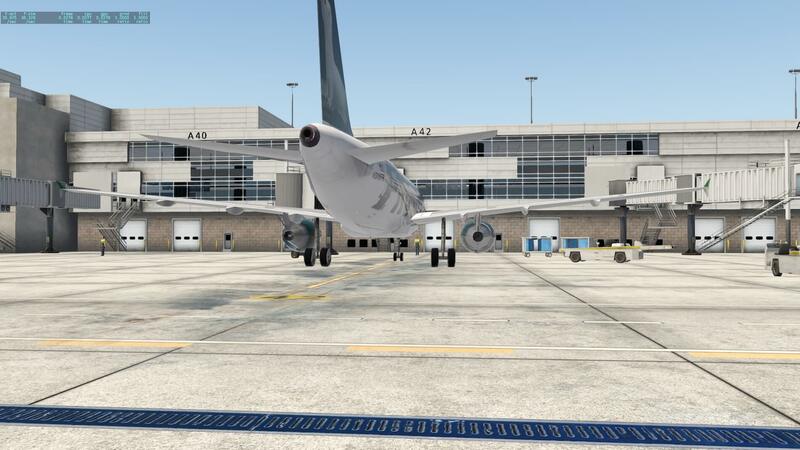 In this review I have used both X-Plane 11.26r2 and X-Plane 11.30r3 interchangeably to provide a comprehensive test using both the penultimate and latest versions of X-Plane 11. In fact X-Plane 11.30r3 had gone final when I was part-way through the review, so I redid the review looking for any disparity between versions. 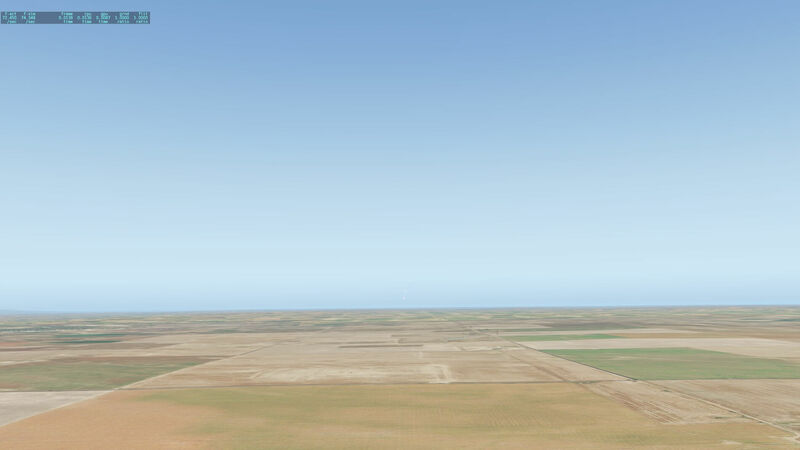 I did notice “heat haze” in X-Plane 11.30r3, but since the review is being done for KDEN I haven’t included it in the review. 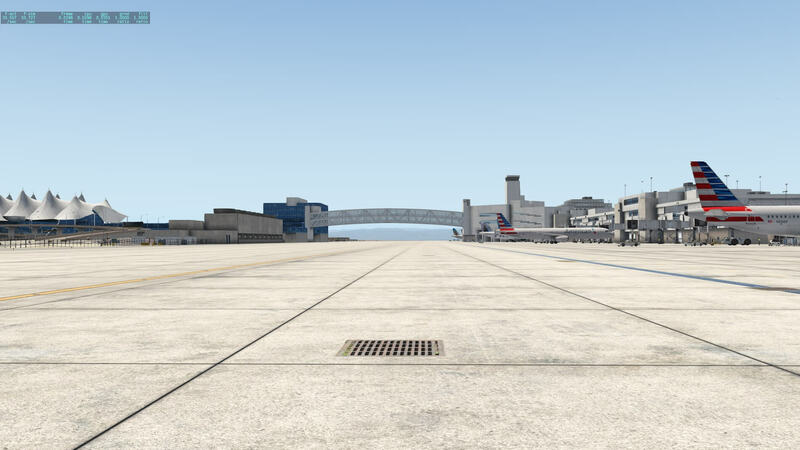 I decided to test fps by flying from south of the Terminal, along the centerline of the Terminal and Concourse complexes. 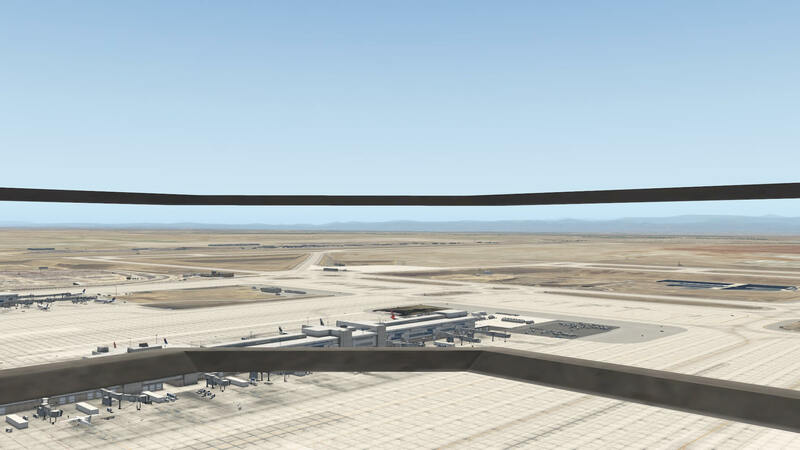 At 1 mile away from the Terminal I was getting 45-50 fps, falling to about 30-34 fps when I had the Terminal occupying all of the width of my screen with all of the concourses visible- about worst case for the number of objects. 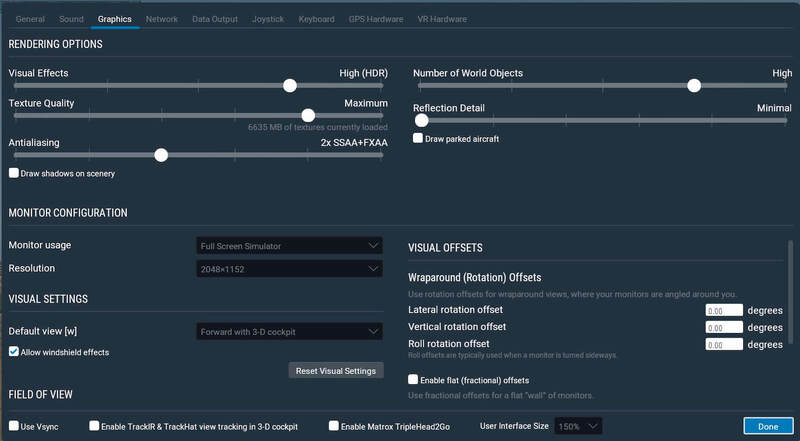 Activating WT3 did not make any large changes to FPS (Frames Per Second). 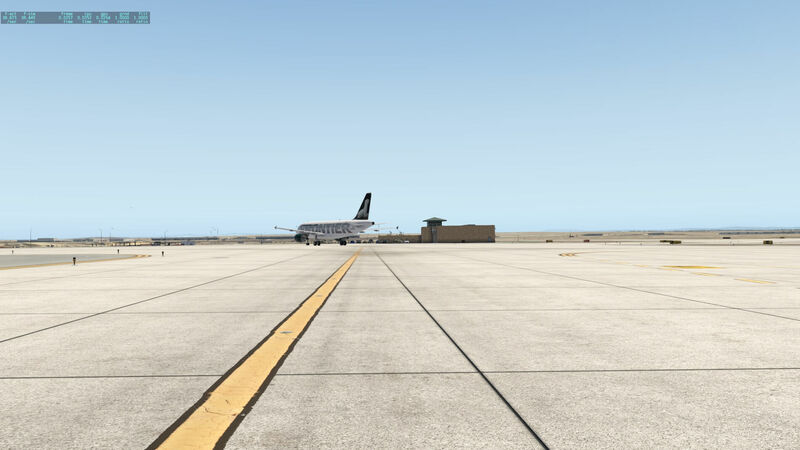 This is in comparison to the X-Plane 11 stock KDEN, where I got close to 75 FPS throughout the same flight. However, I need to reiterate (see my specs in the next section) that I am on a “Late 2017 iMac”, and while the GPU seems to handle rendering well, the limiter is the CPU- which (as in all Macs I believe) cannot be over-clocked. I’m also unaware of the inherent load on the system from the operating system. If you have an iMac like mine you know what to expect- if you have a half-decent PC then expect better. 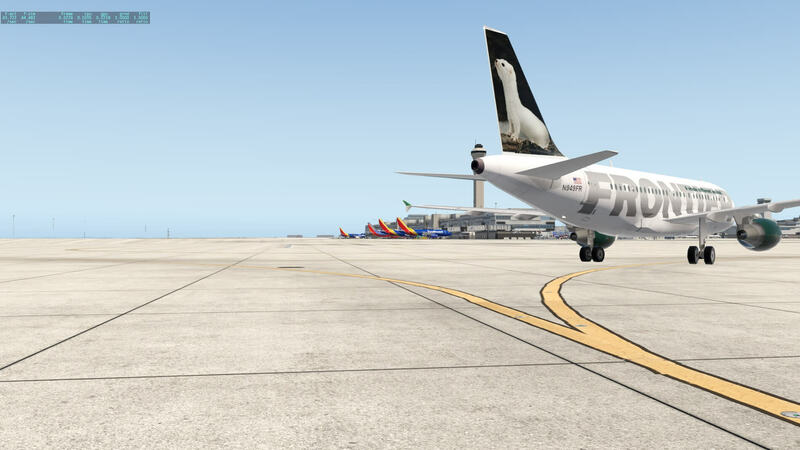 But- even with the better fps, the X-Plane 11 stock scenery was almost laughable given the time I’ve spent in working with X-Codr’s KDEN. Enough said…. I’ve included my graphics settings below. To conclude this review, I do need to mention the excellent support by X-Codr. I posted several questions on his forum at X-Plane.org before he was aware I was doing the review, and got good and useful answers within several hours. I later used PM’s to communicate with him, and found him to be very helpful and excellent to work with. A good product is great, and when combined with excellent customer service it’s priceless! Finally- a great shot at late desk, approach 34L (the center of the 3 runways that offer triple simultaneous independent parallel approaches), showing the incredible night lighting at this airport. Amazing stuff! 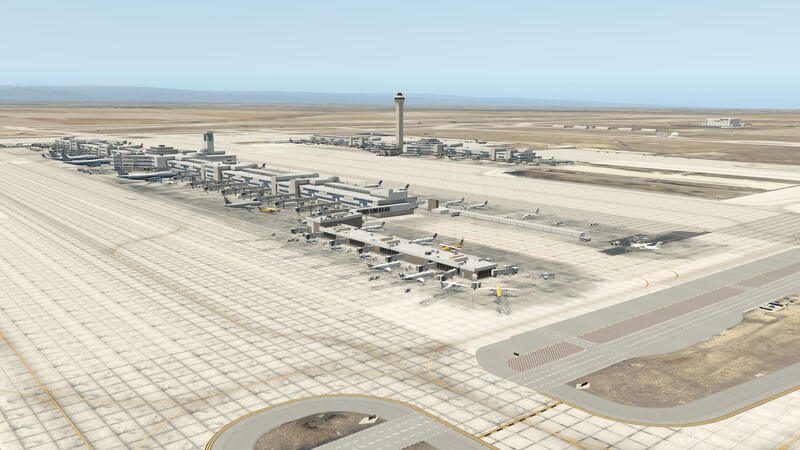 As of this writing, X-Codr Denver International Airport cost you 27.95USD and more information and buying details can be found at the dedicated X-Plane.Org store page. Earlier in this review I referred to the reason why this airport is known as “The Mile high Airport”, as well as the negative operational effects on aircraft of increased altitude and temperature, and that the combination of higher altitude and temperatures occurring concurrently can cause issues with takeoffs and landings. Essentially, at higher than standard temperatures (ISA), the aircraft behaves as if it was at a higher altitude. If the airport elevation is also above mean sea level, then the sum of the airport elevation and the higher than standard temperature reflects the altitude that the plane “thinks” it is at- in terms of engine power output and the effectiveness of the wing. With temperatures in the Denver area averaging 90 degrees F ( 32 degrees C), at an elevation of over 5,000 feet (standard ISA temperature at this elevation is approximately 39 F / 5 C), this can have a large effect on aircraft performance. This article from Flying magazine explains this perfectly. Anyone who has flown into San Francisco KSFO might be very aware of the operational requirements of close parallel approaches- especially in IMC, where airports such as KSFO cannot operate independent simultaneous approaches to a parallel pair. The following article provides some explanations as to the rules applying to parallel approaches. Great review Bruce. 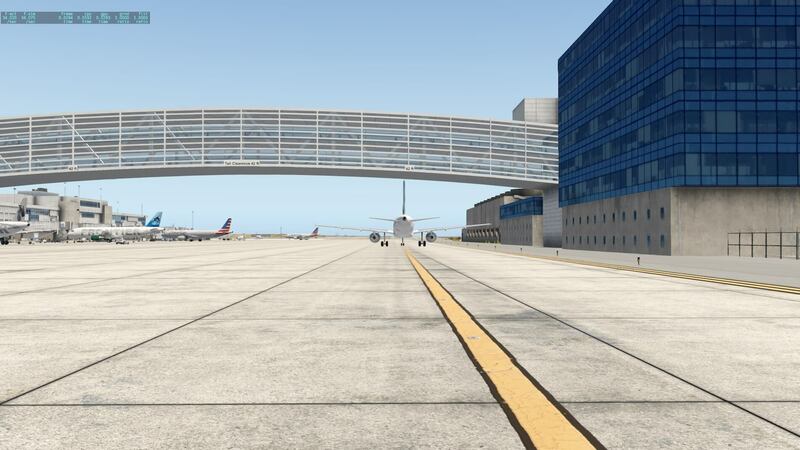 You do indeed need a package like WT3 to bring large airports like this to life. Thanks again for you time writing this review. Thanks Glenn, it was my pleasure! 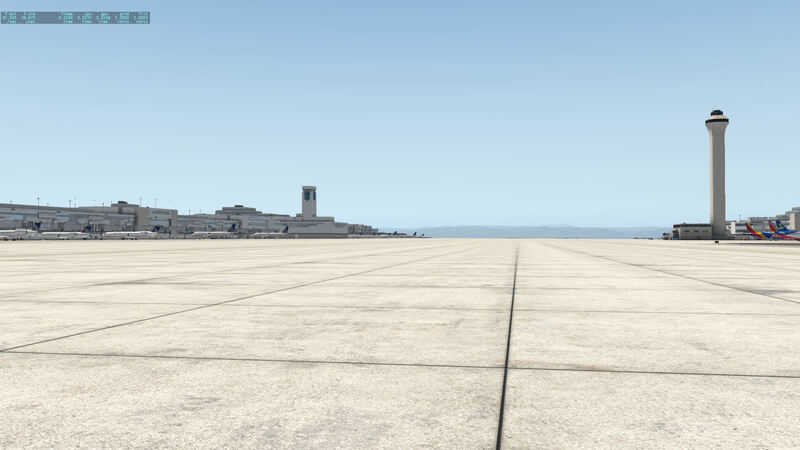 I agree re-WT3, I find I can’t fly without it now- We’re lucky to have such a good sim platform with XP11.